The Dibber is billed as a revolu­tionary tool. Beyond pushing reinforcements into tight spaces, what else does it do? 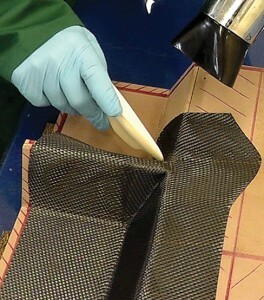 A PhD student at the University of Bristol, at the Centre for Innovative Manufacturing in Composites, in the U.K., has developed a handheld laminating tool acclaimed as simple yet revolutionary. Unfortunately, the press release and online information about the tool, called the Dibber, doesn’t say exactly what problem it was intended to solve, or how it is used. The photo suggests it helps press fabric into tight spaces. Two hundred Dibbers were injection-molded from acrylonitrile-butadiene-styrene (ABS) and distributed from the Centre for Innovative Manufacturing in Composites stand at the Advanced Engineering Show held in Birming-ham last November. The school reports positive feedback. Gardeners know a dib-ber (or dibble) to be a pointed tool for making holes in the soil for plants, seeds, or bulbs. And in Britain, the term is slang for money and television clickers. Anyone who has firsthand knowledge of the Dibber, please e-mail dan@nullproboat.com.